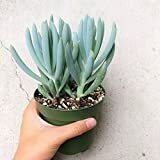 Senecio serpens growing herbaceous succulent of the genus Senecio also known as Blue Chalksticks, Senecio serpens perennial evergreen plant, used as ornamental drought tolerant plant, can grow in subtropical, mediterranean, desert or temperate climate and growing in hardiness zone 9-12a. Leaves color green to gray in linear shape and leaves are fleshy. Flower color yellow in cone shape, flowers grow in clusters on the top of the stems.